Brad Schwieger has been teaching at Ohio University since 1990 and is presently a Professor of Art and Ceramics Area Chairman. Prior to that he was an Associate Professor at Vincennes University in Indiana (1985-1990). Brad received his Master of Fine Arts degree from Utah State University in 1983 and his Bachelor of Fine Arts degree from the University of Iowa in 1981. 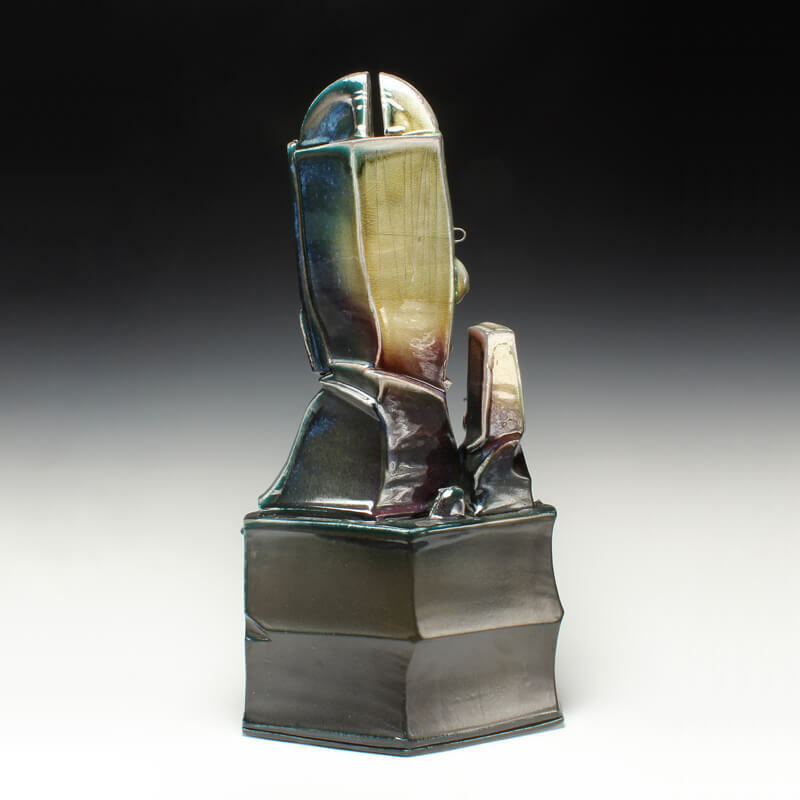 Brad has shown his ceramics nationally and internationally. His work has been included in exhibitions through out the U.S.A., Japan, Korea, Taiwan, England, Germany, Czech Republic, Lithuania and Spain. Brad has been a resident artist at the Red Lodge Clay Center, Red Lodge, Montana, 2009. International Ceramics Symposium, Bechyne, Czech Republic, 2006. Seto Ceramic and Glass Art Center, Seto, Japan, 2005 and 2001. Watershed Center for Ceramics in New Castle, Maine, 2003 and 1997. Gallery Estudi, Poble Espanyol, Barcelona, Spain, 2002. The Archie Bray Foundation for Ceramic Arts, Helena, Montana, 1998. Kunstlerhaus 188, Halle, Germany, 1999. Burg Giebichenstein, School for Art and Design, Halle, Germany, 1996. Jiesia International Porcelain Symposium, Kaunus, Lithuania, 1994. Romhild International Ceramics Symposium, Romhild, Germany, 1993. His gallery affiliations include: Society for Contemporary Crafts, Pittsburgh, Pennsylvania, AKAR Gallery, Iowa City, Iowa, Red Star Studios, Kansas City, Missouri, The Clay Studio, Philadelphia, Pennsylvania, Signature Shop and Gallery, Atlanta, Georgia, Red Lodge Clay Center, Red Lodge, Montana, Washington Street Gallery, Lewisburg, West Virginia. Brad has presented workshops and lectures at more than 80 Universities, Colleges and Art Centers including the Penland School for Arts and Crafts, NC, Arrowmont School for Crafts, TN, Anderson Ranch Art Center, CO, Peters Valley Art Center, NJ, Santa Fe Clay, NM and the Appalachian School for Crafts, TN. His work is included in numerous collections including the Renwick Gallery, Washington, DC and the Mint Museum of Craft and Design, Charlotte, NC. His work has been published in Ceramics Monthly, American Craft, Clay Times, Ceramics Art and Perception as well as several textbooks. For several years my work has been driven by a variety of architectural influences, both man made and forms that I see in nature. These influences have found their way into my functional and non-functional work. My interest in these subjects started years ago as a symposium artist in Europe. In Eastern Europe, I was taken by the eclectic architectural styles of the late 18th and 19th century, from medieval buildings to the Art Nouveau and Neo-classicist styles of the 1930’s. In Barcelona, Spain I was confronted by the amazing work of Antoni Gaudi. His prolific vision is in a class of it’s own. I find an interesting parallel between architecture and pottery. Like architecture, pottery deals with elements of form and structure, interior/exterior, utility or containment, surface detail and adornment. I have attempted to synthesize these interests and produce work that shares the minimal and complex, the miniature and monumental, the formal elements of design, the implied and the possibility of actual function.